The Serious Sports Conference, organised by the Sport and Exercise Science Group, saw 150 researchers, students and practitioners within the sport industry come together to exchange knowledge and best practices. Andy Banks spoke of the importance of psychology in the sport of diving and professional athletes' struggles with overcoming their fear. 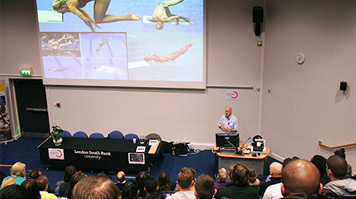 He revealed his winning diving techniques in training champions including 2012 Olympic bronze-medalist Tom Daley - explaining his views on the science behind the processes. "Dealing with the fear of diving is pivotal in an athlete's career," says Andy." It is important for a diver to feel confident and a coach plays a massive part in building controlled bravery." Andy understands the basic 'Inverted U Theory' which examines the link between pressure and performance. He is careful to maintain his athletes of all ages within their comfort zone where they are happy and motivated to train and to compete. Showing a photo of a sleepy young Tom Daley he said "in theory we needed more hours but this wasn't working for him, so we needed to adapt." When training athletes, he applies a four step process which is crucial in diving: take off, shape, come out, and water entry. "Each stage is essential during training and you cannot move on to the next stage until each is completed." explained Andy. "There is no such thing as luck, it is about the preparation and following the process." Contrary to many psychology books Andy believes goals should be set on performance rather than outcome. "The focus should be on performance not the outcome; we can't control the outcome but we can control performance." This one-day conference brought together sport and exercise experts from across the UK to join the LSBU researchers. Other keynote speakers were sport psychologist Chris Harwood from Loughborough University and elite physiologist Florentina Hettinga from the University of Essex. A lively two-hour panel discussion also included 70-year-old ironman competitor Edwina Brocklesby, founder of Silverfit, and her coach and world number one duathlete, Annie Emmerson. After the resounding success, the Sport and Exercise Science Group is already organising the 2015 edition of the Serious Sports Conference.